Some of you might remember the Laser Tag came from the 80’s. If you don’t, then I don’t blame you, because there were many imitators. Essentially, you have a laser that shoots at a target, and you can score points shooting other people with these targets. You know, I did a terrible job explaining that, but if you haven’t heard of Laser Tag or its subsequent imitators, where have you been? 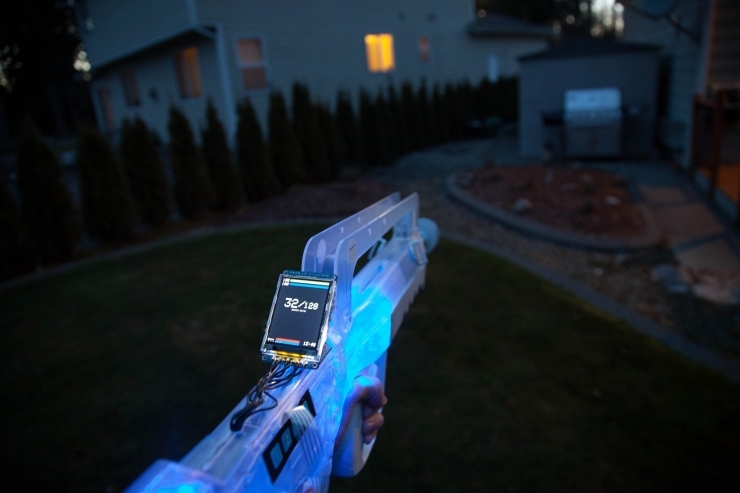 This is a new laser tag called Skirmos, and it has customizable hardware to design any kind of game that you want. There is an LCD screen attached to the weapon, and it shows things like health, kills, time left in the game, ammo count, and anything else that you want to program to play this real-life FPS game. In case you can’t remember the aforementioned Laser Tag game, they didn’t have that LCD with all these features. Their lasers also didn’t communicate with others, and you couldn’t download games from their websites. This was because back in the eighties, websites didn’t exist yet! The Skirmos is a Kickstarter project and it probably won’t have any problem meeting its funds.